Otters live in the sea or in rivers and they hunt for fish, shellfish and other animals. You might think they’re related to seals, but they’re actually related to weasels and badgers. North American river otters live along rivers in many parts of the United States. 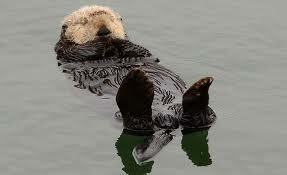 Sea otters spend most of their lives in the ocean, coming onto land only to rest. Giant otters live in South American rivers, feeding on frogs, eggs, and even anaconda snakes. 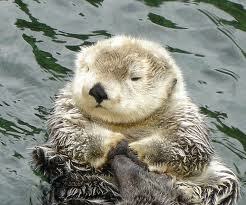 Sea otters spend most of their lives in the ocean, coming onto land only to rest. I bet you didn’t know that all about otters. Otters have webbed feet and are expert swimmers. River otters can dive 60 feet or more. Sea otters dive even deeper in search of food. 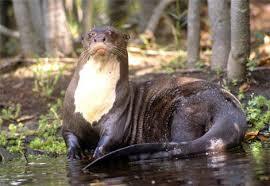 Giant otters live in South American rivers, feeding on frogs, eggs, and even anaconda snakes. Sea otters rest and sleep by floating on their backs. They groom their fur so it stays water-repellent. Sea otters live in the northern Pacific Ocean, along the coasts of California, Washington, Oregon, Alaska, Russia and Japan. Sea otters use rocks to break open clam and mussel shells. River otters love to slide down muddy hills or ice into the water. Mothers and babies play together. Sea otters have the thickest hair of any mammal. Their fur helps keep them warm in cold water. River otters live in underground dens. Sea otters rest and sleep by floating on their backs. A playful otter in the San Diego Zoo. Question: Do sea otters get tired of swimming? Answer: Sometimes they rest near beaches. They anchor themselves with seaweed so they don’t float away. Answer: No. Otters are afraid of humans and will hide. If cornered, they might scratch and bite. They are cute, but wild. Enjoyed the Easy Science for Kids Website all about Otters info? Take the FREE & fun Otters quiz and download FREE Otters worksheet for kids. For lengthy info click here. Declan, Tobin. " Fun Otter Facts for Kids ." Easy Science for Kids, Apr 2019. Web. 23 Apr 2019. < https://easyscienceforkids.com/all-about-otters/ >.